Mohamed Hardi, Deputy Director of the Programmes Division at Singapore’s Municipal Services Office, on building more agile services. China’s WeChat app is one of the world’s most-used mobile apps this year, with over a billion monthly active users, according to Technode. Through this one multi-purpose app, people can message their friends, shop, make online payments, hail a taxi, and many more everyday tasks besides. WeChat runs on over 2,000 such micro-services – and has inspired Singapore’s municipal services unit to rebuild its digital products, said Mohamed Hardi, Deputy Director of the Programmes Division at the Municipal Services Office (MSO), Ministry of National Development of Singapore. “We looked at what’s out there. We looked at WeChat, for example – it’s actually a very proven model in China, so we actually adopted it for OneService,” he said at last week’s Innovation Labs World global summit presented by GovInsider. The OneService App, launched in 2015, began as a single platform for any resident to report municipal issues without first having to figure out which government agency to go to. “What we wanted to do was to have a simple platform,” Hardi explained, but “apart from just having to look at municipal issues, this year we expanded it wider”. The app was revamped last month to allow integration of existing government apps as micro-services that can be accessed through OneService. Micro-services are modular services that carry out one specific task – for instance, one micro-service may handle logins only, authenticating your username and password. Another micro-service may handle payments, accepting credit card information and executing the online transaction. As in WeChat’s case, micro-services allow users to do a large number of things on one app. MSO’s approach moves away from the need to build individual apps. Instead, various municipal-related government services from its partner agencies can be launched on a single app, so that users do not need to toggle between multiple apps. “That’s a very good idea, and we learnt it from WeChat,” Hardi said. For instance, MSO has launched two new features on OneService: ‘Start Parking’ and ‘Find Parking’, with the latter currently in beta. 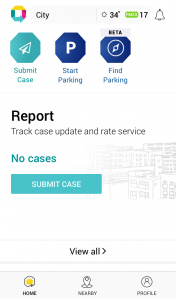 Rather than coding a new service from scratch, the team integrated OneService with the existing Parking.SG app, and developed the new ‘Find Parking’ feature to enable parking transactions and provide parking information respectively. It is more convenient for motorists to find car parks and pay for parking sessions in a single app, Hardi noted. “We can continue to add new features in the future as a micro-service by just putting the icon in front, and connecting it to a web service,” he said. Besides parking, the next step is to elevate the app to a tool that could “engage the community”, according to Hardi – connecting volunteers, grassroots organisations, and residents; involving them in solving municipal issues; and collecting feedback on community projects that will impact their lives. “It’s very important: get ideas from the residents, or citizens, get it from the industry, work with them, because they are actually the ones who are your stakeholders,” he remarked.